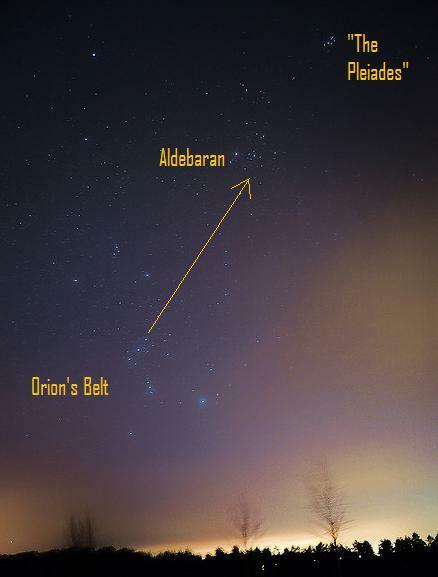 Orion's Belt points to the red star Aldebaran, and to the Pleiades star cluster. The Pleiades can be seen without binoculars, even from light-polluted cities. 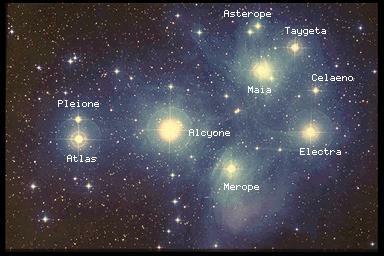 Also known as the Seven Sisters and M45, the Pleiades is an "open star cluster." The Pleiades contains over 3000 stars, is about 400 light years away, and is 13 light years across. The photograph also shows the blue reflection nebulae (gas clouds) that surround the stars.